alcofribas.com: What do you need to survive into the wild? 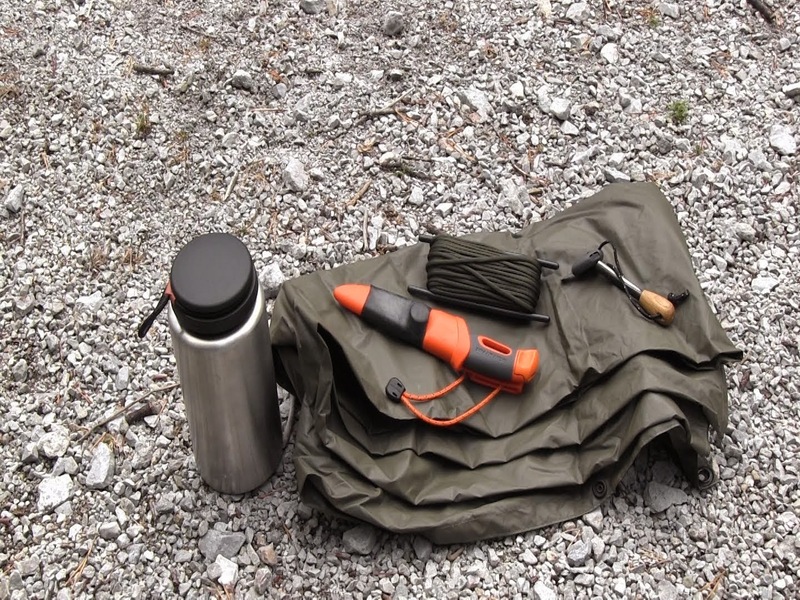 A quick note about the equipment needed for survival in the wilderness. Depending on the geographical environment the priorities will change. The primary items are the first 5 categories below. The others are secondary. In most places, the first thing that might kill you in a couple of hours is hypothermia. Therefore the most precious item one needs to carry with him is good clothes and good cover. A 100% wool blanket will provide insulation even wet. A sleeping bag is lighter and will keep you warm if you keep it dry. It will let you sleep well. A poncho or a tarp will protect from rain and wind. A tent is a good shelter, good for bugs. Fire not only provides heat but it is a good psychological boost. It will repel wild animals by signaling you with the smell. It is important to cook as well. Knowing how to start a fire in any condition and carrying a good fire kit is important. This can be a lighter, a fire steel, a flint and steel or any other tool that can help start a fire. A knife or an axe is very useful. In a tropical jungle, a machete is preferred and is all one really needs (if ones has the knowledge!). In a northern forest, the axe is the primary tool, and a good saw will be very useful. These tools will help process wood for the fire and are perfect to build shelters and all sorts of tools. A metal container is a must. It is hard to make a metal container in the wilderness! It will help carry water and also boil it to purify it. It will also be perfect to cook. If weight is not an issue one could use a caldron to cook (like a Dutch oven made out of cast iron)... another metal container kept clean just to boil water... and other sorts of containers just to carry water (made out of metal or not). Quality cordage is painful and very long to make from scratch. Roots and plants can be used but it takes time and it is always good to carry some sort of cordage to tie things, to fish, to repair, to build traps, to build or consolidate or put a shelter together. If you are stranded in the wilderness and looking to be rescued, you might want to signal yourself with devices such as a whistle, a reflecting mirror, flashy colors (anything orange), a smoky fire and so on. Most "survival kits" include signaling devices. Depending on your environment, some elements will be more useful than others. In a jungle you can survive naked with just a machete. In the desert, finding, making and carrying water is the biggest priority. In a wet-cold environment, one can die of hypothermia in one hour. If you are travelling on foot you must think ultralight... if you have a canoe, or a sledge or a horse or a car you can carry much more.